Frank Petriello pursues a research program in precision QCD in order to improve the Standard Model predictions for important hadron collider observables and their backgrounds. 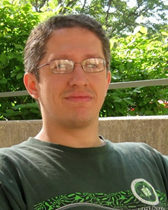 He has developed a variety of novel techniques to facilitate the ultra-precise comparison of theoretical predictions with experimental data. A second goal of his work is the development of new strategies to search for and study new physics at the Large Hadron Collider and in other experiments.